G7 countries and the United Nations have condemned the continued fighting in Libya’s western region and on the outskirts of Tripoli as forces from the east of the country under Khalifa Haftar’s command march on the capital. The G7 group of rich countries urged all parties “to immediately halt all military activity”. In the meantime, after a closed meeting on Libya called by the UK, the UN Security Council demanded Haftar halt his military operations in western Libya and Tripoli and return to his forces to their positions. 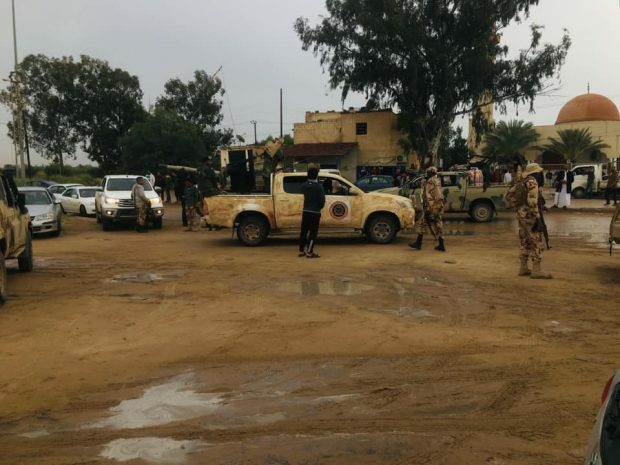 On Thursday, Haftar’s forces took the town of Gharyan 100km (62 miles) south of Tripoli and then Bridge 27, which 27 kilometers away from Tripoli, but forces from Al-Zawiya military council managed to retake the bridge and push the forces back to Gharyan’s outskirts. Over 100 fighters from Haftar’s forces were captured along with tens of military vehicles in the operation of the bridge, which was later on Friday visited by the Head of the Presidential Council Fayez Al-Sirraj. Conflicted reports on Friday said Haftar’s forces had taken the capital’s airport, which has been closed since 2014, however; Tripoli Protection Force said it was just a brief attempt and they regained control of the airport and the airport road. In the meantime, fighting on Friday intensified in Sooq Khamis Emsaihel, in another frontline in western Libya and in parts of southern Tripoli, including Qasir Benghashir, and Naqliya Camp, as well as Wadi Al-Rabea. Full military backup from Misurata brigades had been sent to the capital’s hot spots, where the fighting is raging.